Earlobe lift or earlobe surgery is a cosmetic procedure done to repair and correct the earlobes attached to the ear in order to give it a new shape to earlobes or redress the earlobe. Earlobes are accompanied to the ears adding to their normal appearance along with that, acting as the apt location for various persons to wear out accessories. Every person has variations in their earlobes. Since wearing of heavy weighted ear ornaments tears the earlobe tissue apart and this split up portion may not look good on an aesthetic aspect. So as to correct it, Earlobe lift or surgery is used. 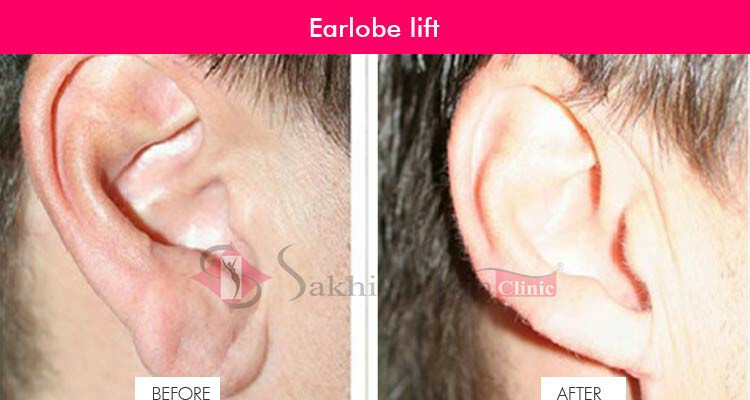 It helps in modifying stretched earlobes and minimizing the scars on the piercing openings. The earlobe surgery is also recommended to those patients feeling trauma or distress due to deformity in the ear. 1. Stretched, torn or damaged earlobes. 2. Tough and rough scars. 3. Injury on the ear. 4. The irregular shape of the earlobe. Earlobe surgery is an outpatient technique which hardly takes an hour to accomplish the process. This includes an efficacious and persuasive mechanism that involves almost an hour to complete it off without asking the patient to stay overnight in the hospital or clinic. It consists of few steps that are followed during the treatment: The preoperative procedure is there in which the patient going for surgery is abstained from smoking and taking aspirin products Local anesthesia is given initially to numb the ears Then earlobe lift or surgery is performed. It starts off with the incision which is made so as to remove the extra skin tissues and stitching the splits to give a fine edge and a freshening piercing tract. 1. Avoiding heavy exercise for the first few days. 2. Using 3 to 4 pillows at the starting. 3. Use of a hair dryer is avoided. Earlobe lift or method is found to be the most appropriate process so as to reshape or ameliorate the ear structure back to the normal one. Stitches are dissolved very speedily in about a week. No surgery failure possibility is there. It also holds potential complications like other surgeries . Notching and Rubbing the ear side. Scar formation may be to an excessive extent. Discomfort is felt by the patient at times. Sometimes, Infection is tend to occur but there are antibiotics which heals it. A little bit of swelling and bruising. 1. Stretched earlobes due to ear ornaments. 2. The piercing hole of the ear gets torn and splits up due to the wearing of heavy ear accessories. 3. Due to decrease in collagen also the elasticity of earlobe minimizes and so to redress the saggy earlobes, Earlobe lift is applied.